Before 1933, Berlin was the place to be. There were bars, clubs and parties to satisfy every taste. Unlike most of Europe at the time, it was possible in this pre-WW2 city to be openly homosexual and enjoy a relatively normal – whatever that is – life. However, things changed in 1933 when the Nazi party under Adolph Hitler, took control. Bars, clubs, cabarets were shut down in droves and hedonism was discouraged by extreme measures. If you happened to be a poor Jewish homosexual man, then your options were very limited and the best move was to get out of Germany and seek more friendly skies. 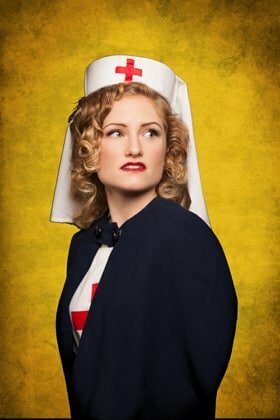 Welcome to the world of Miss Nightingale which is currently enjoying a successful run at The Vaults, Waterloo. London 1942 and the war is at its height. The Americans have finally turned up to join in and London is awash with people who realise that as they could be dead tomorrow, they really need to live each day as if it’s their last. Aristocratic war hero, Sir Frank Worthington-Blythe (Nicholas Coutu-Langmead) is looking for an act to top the bill at his cabaret club. Luckily his alcohol provider, local spiv Tom (Niall Kerrigan) knows just the team for Frank’s club. Tom introduces Frank to his girlfriend, down to earth northern lass Maggie Brown (Tamar Broadbent) and her composer friend George (Conor O’Kane). Maggie sings one of George’s irreverent comedy songs and Frank is instantly won over. Re-naming her Miss Nightingale, Frank hires her and George on the spot. Maggie is an instant hit and everything in the garden seems to be rosy. However, things are not always as they appear. Maggie is worried about her brother Harry (Matthew Bugg) and Tom is up to his ears in nefarious goings on, while Frank, a stalwart of society has a secret, he is homosexual. As befits a man of his position, Frank has to hide this aspect of his life from the world, a task that is difficult enough under normal circumstances. Normally, he is restricted to picking up ‘trade’ in the blackout but when he begins a proper relationship with George, everyone’s life is changed beyond all recognition. In this, the 50th anniversary of the partial decriminalisation of Homosexuality, Miss Nightingale is a timely reminder of what it was like to be a gay man before this date. During the show, there is a radio news bulletin about twelve gay men being arrested in Wales – an event that actually occurred with two of the men committing suicide rather than facing British justice. Gay men that thought they had escaped persecution by the Nazis by fleeing to Britain soon had their illusions shattered. Although we didn’t put them in concentration camps or experiment on them, they were still persecuted and this show really brings the constant fear that these men lived under into focus with its story of forbidden love and secret passions. Writer/Director Matthew Bugg has put together a really interesting story that links the characters together really well. Some of the dialogue may not be authentic 1940s idiom but, on the whole, it works well as do the various songs that run through the show. There is a range of music from the sultry ‘Meine Liebe Berlin’ to the rather raunchy ‘Sausage Song’ and all of them feel very authentic for the time. Designer, Carla Goodman’s stage works beautifully to create various locations and, even though there are a lot of items on view, the stage never seems too full as the cast move around, acting, singing and playing all the instruments – oh yes this lot are the proverbial ‘quadruple threat’. I think my only issue really was that seemed to be some minor sound issues sometimes which meant that I lost some of the words to songs – this was particularly true of the ones such as ‘Understudy’ in which different lyrics are sung by each character. Moving to the cast though, a quick shout out to Tobias Oliver who was lovely as Stage Manager Clifford. It’s a small role but Tobias really made Clifford such a sweet loveable character I wanted to see more of him. Moving to the main cast and Tamar, Nicholas and Conor were excellent in the three main roles. Tamar really knows how to deliver a cheeky double entendre-filled song and at times seemed to be channeling both Max Miller with a lovely dose of Mollie Sugden thrown in. Nicholas made Frank everything you would expect a repressed upper-class Englishman to be. Born with a belief in his right to rule, Frank is arrogant but also very vulnerable and never more so than when he is with George. Supremely confident in knowing who he was – even if in fear of being found out – George is an outrageous flirt who really puts his wonderful accent to good use when seducing Frank and the audience. All told, there was a lovely chemistry between the three leads and when they sang ‘together at the end, you really got the feeling that they would survive the war and end up together in the same old folks home enjoying a well-deserved retirement. Summing up then, it’s pretty obvious I enjoyed Miss Nightingale. Yes, there were problems with some of the dialogue and the sound quality but ultimately, Miss Nightingale is a really lovely story of love in the most unlikely of places as the world went to hell in a handcart. Given events happening in the world towards gay men today, it’s a timely reminder of how bad things can get. Miss Nightingale champions a woman’s fight for her voice to be heard in a world of men. At the same time it reclaims the forgotten fate of gay men castigated as ‘the enemy within’ during the Second World War. Set against ‘Miss Nightingale’s’ dramatic rise to stardom and self-empowerment is the romance between two of the men in her life – George, a Jewish composer, and Sir Frank, an upper-class impresario – at a time when society refuses to recognise their love and violently rejects their right to be together. 2017 sees the 50th anniversary of the partial decriminalisation of male homosexuality in England and Wales. As parts of the ‘Free World’ seem to be turning their backs on homosexuality, Miss Nightingale is a timely – yet disarmingly entertaining – reminder of the progress we’ve made but the steps we have still to travel. The show features 20 original songs by Matthew Bugg, from innuendo-laden Music Hall style numbers to tender ballads and complex trios and quartets, which wonderfully capture the soaring spirit and biting wit of the 1940s.